Pyrosequencing followed by conventional PCR and sequencing was used to determine the complete nucleotide sequence of three plasmids (pRCEID2.9, pRCEID3.2, and pRCEID13.9) from the Lactobacillus casei strain TISTR1341. 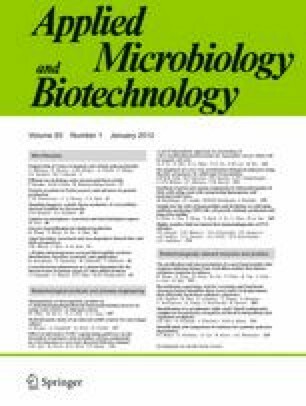 The plasmid sequences were found to be almost identical, respectively, to those of pLA106, pLA105, and pLA103 from Lactobacillus acidophilus strain TK8912, suggesting that these strains may be related. Sequence analysis and comparison indicated that pRCEID2.9 replicates by a rolling circle (RC) mechanism, while pRCEID3.2 and pRCEID13.9 probably follow a theta-type mode of replication. Replicons of pRCEID2.9 and pRCEID13.9 were used to develop Escherichia coli/L. casei compatible shuttle vectors, which were stably maintained in different genetic backgrounds. Real-time quantitative PCR analysis showed copy numbers of around 4 and 15, respectively, for the pRCEID13.9- and pRCEID2.9-derived shuttle vectors per chromosome equivalent. The functionality of vector pRCEID-LC13.9 was proved by cloning and expressing in L. casei of a green fluorescent protein gene variant from Aequorea victoria under the control of the promoter from a homologous lactate dehydrogenase gene. The new vectors might complement those currently in use for the exploitation of L. casei as a cellular factory and in other biotechnological applications. This study was supported by grants from the Office of the Higher Education Commission through CHE Ph.D. Scholarship (to M.P.) and through the Higher Education Research Promotion and National Research University Project (to V.L. ), the National Center for Genetics Engineering and Biotechnology (BIOTEC), and the Research and Diagnostic Center for Emerging Infectious Diseases (RCEID), Khon Kaen University, Thailand. Further support was obtained through a project from the Spanish Ministry of Science and Innovation (ref. AGL2007-61869-ALI) (to B.M. ).